ASBESTOS DUMP ALARM: Cafpirco Road resident Mark Byrne fears the Mount Gambier district is being targeted by Victorian-based asbestos contractors. 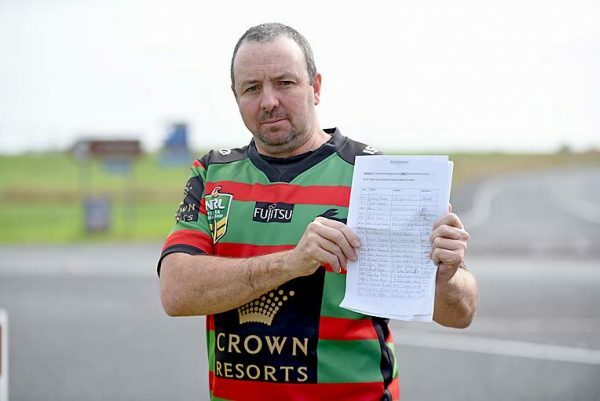 He holds a petition opposing the dump. GRANT District Council has raised fears the Mount Gambier district is being targeted as a potential dumping ground for asbestos by interstate contractors. This follows a Warrnambool-based contractor seeking approval from the state’s environment regulator to discard asbestos at a quarry on the fringe of Mount Gambier.